MEXICO – The Oswego County Academic Youth (OCAY) League held its 75th event since its inception and kicked off the 2015-16 year with another of its unique academic competitions. Sandy Creek’s team took the top spot in the first event of the season for Oswego County Academic Youth League. The team members included Rosie Morgan, Brigid McClusky, Dylan Bryant, Tyler Brown, Zeke Durham, Kate Hanni, Andrew Olin, Adaiah Bauer, Nicky Radford and Toni Duehring. 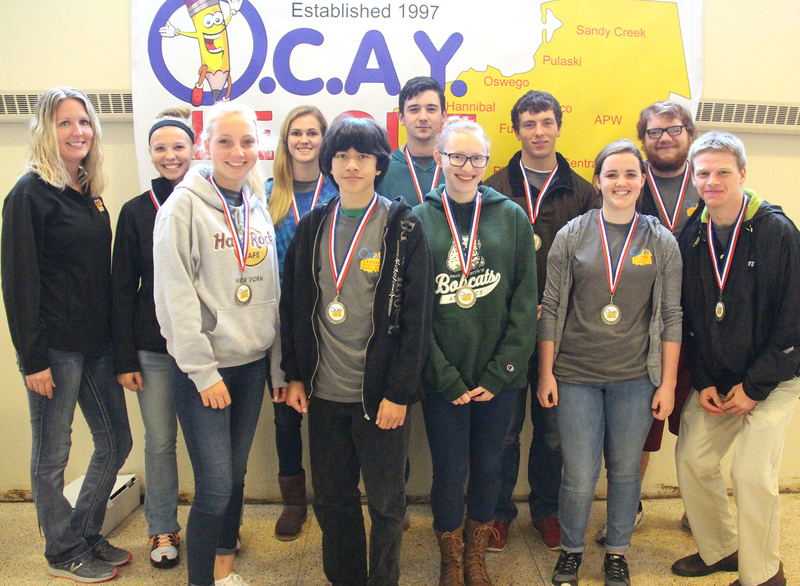 Eight districts from across Oswego County participate in OCAY League with teams of up to 10 students competing in various academic challenges. Event one, a test across the academic spectrum, featured pairs of team members completing individual academic challenges with an opportunity to make up lost points through a series of physical tasks. All team members participated in the timed test challenges. Earning the silver medal and finishing second was the team from Fulton’s Bodley High School. Team members included: David Houck, Trey LaRock, Ben McKay, Sarah Rice, Nick Riciputo, Victor Runeare, Phillip Summerville, David Tallents, Makhali Voss and Austin Wilde. In addition, team members worked on a skit based on one of three Native American Folklores: Why do snakes shed their skin? Why do buffaloes have humps? And, Why do ducks have webbed feet? The students were encouraged to be creative in their skit scripts and performances and they did not disappoint the judges. 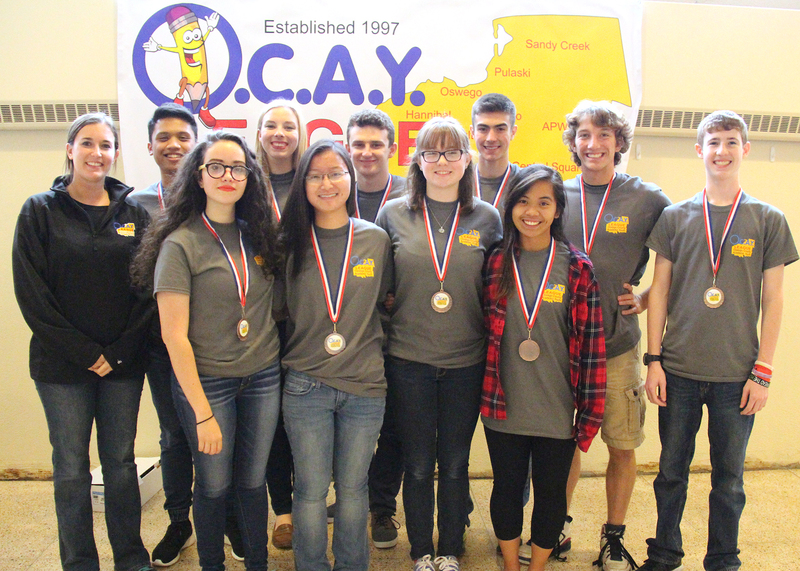 The teams all wear OCAY League shirts and are identified only by team number as they perform their tasks for the events. Independent judges, using a rubric score the teams. When all of the points were tallied, the team from Sandy Creek was named top finisher in the competition. Team members Ana Alcasid, Jenna Ballard, Ayla Busch, Olivia DeLorenzo, Clare Donovan, Evan James, Roman Madlangbayan, Luke May, Jordan Runner and Chris VanGorder represented Oswego High School for the bronze medal third place spot at the recent OCAY League competition. They were awarded gold medals for their first place finish. In second place, and receiving silver medals was the team from Fulton with the Oswego team taking the third place bronze medal. 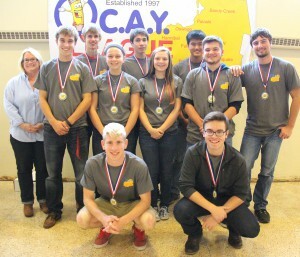 OCAY League is coordinated through the Center for Instruction, Technology and Innovation’s Arts-In-Education Department and the league is directed by Matt Goodnough.